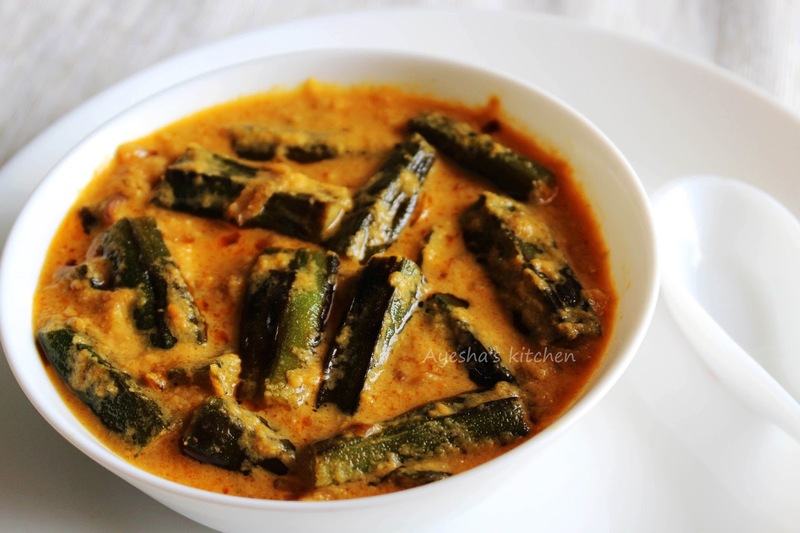 Here is your favorite sauteed bhindi in a creamy tangy gravy bursting with flavors. Bhindi / vendakka is a wonderful ingredients for making creative yummy dishes that benefits to your body in more ways than one. Okra / bhindi / vendakkai / bhendi is a high fiber vegetable which is known for its soluble and insoluble fiber content. Okra helps in controlling diabetics, helps you to lose weight, prevents heart diseases, improves immunity, good for pregnant woman and much more okra health benefits. But unfortunately bhindi isn't much popular with many of us. 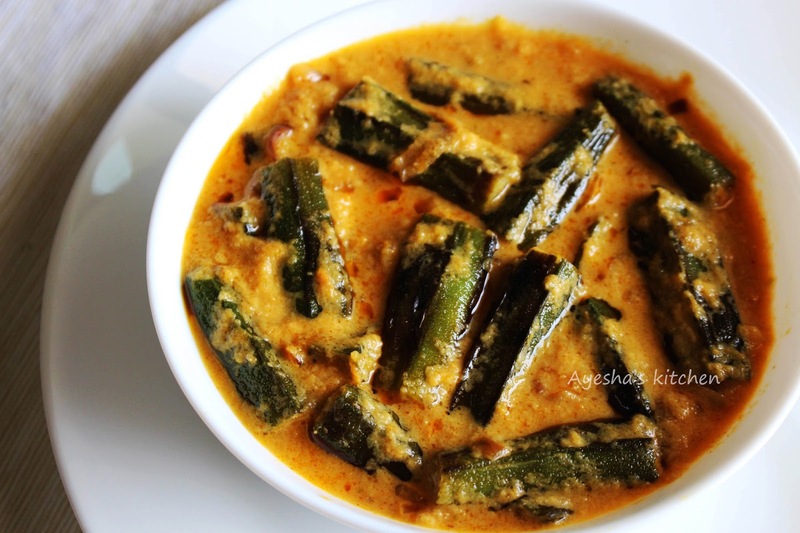 Mostly people prefer okra curry / bhindi curry recipe, bhindi fry recipe and like so. Do try yummy creative dishes with this easy to cook and readily available veggie. So here is the recipe showing how to make bhindi masala gravy / bhindi masala recipe / north indian dishes / chapathi side dish. Wash the okra / ladys finger well and cut it into 1.5 to 2 inch pieces. Drain the excess water and set aside. Grind together all the ingredients given under 'for grinding' to a fine smooth paste. Set aside. Heat a pan with 2 tsp of oil and saute this okra over a medium flame until they are cooked and lightly brown from sides. When done, transfer it to a plate and set aside until the gravy is done. Now in the same pan heat some oil and saute the onion until translucent. When done, add the spice powders (chili, coriander, turmeric and cumin) and saute over a low flame. To this, add tomato curd mixture and mix well. Cook it until oil floats on top. When done add half a cup of water and stir well. You will get a thick gravy now. You can add more water for a thin consistency gravy. Season with salt and add sauteed ladys finger and stir well. Cook over a medium flame for about 5-7 minutes. Finally add kasuri methi and stir. Switch off the flame. 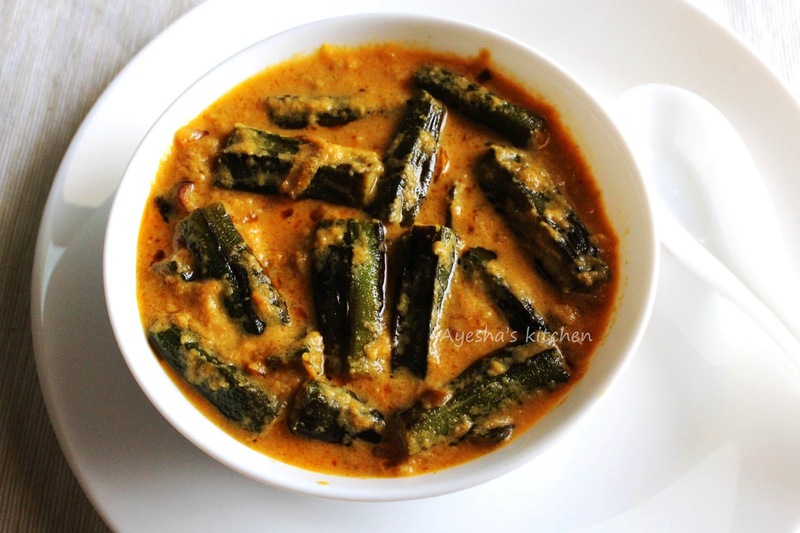 Serve this hot bhindi masala gravy with chapati / paratha/ rice.